A remarkable montage of poems that explore film, poetry, and the elusiveness of reverie. A. Van Jordan, an acclaimed American poet and the author of three previous volumes, “demonstrates poetry’s power to be at once intimate and wide-ranging” (Robert Pinsky, Washington Post Book World). In this penetrating new work he takes us with him to the movies, where history reverberates and characters are larger than life. The Cineaste is an entrancing montage of poems, wherein film serves as the setting for contemplative trances, memoir, and pure fantasy. At its center is a sonnet sequence that imagines the struggle of pioneer filmmaker Oscar Micheaux against D. W. Griffith’s The Birth of a Nation, which Micheaux saw not only as racist but also as the start of a powerful new art form. “Sharpen the focus in your lens, and you / Sharpen your view of the world; you can see / How people inhabit space in their lives, / How the skin of Negroes and whites both play / With light.” Scenes and characters from films such as Metropolis, Stranger than Paradise, Last Year at Marienbad, The Red Shoes, and The Great Train Robbery also come to luminous life in this vibrant new collection. 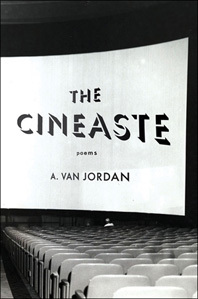 The Cineaste is an extended riff on Jordan’s life as a moviegoer and a brilliant exploration of film, poetry, race, and the elusiveness of reverie. linger in the space in which they occurred. absorb over time; no act will wholly evanesce.